There’s no better time than the holidays to remind children to be thankful and to give back to others in need. However, that is not always easy during this busy time of year. That’s why Save the Children is using a holiday tradition of donning “festive” sweaters as an easy, fun way to raise awareness about helping the youth of the world in need. Kids can help make the world better by wearing a holiday sweater on Dec. 12. Photo by Dan Burn-Fort / Save the Children. 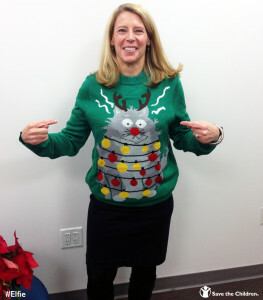 On Dec. 12, Save the Children’s Make the World Better with a Sweater holiday fundraising campaign is dedicated to rallying people to wear their quirkiest holiday sweaters and give just $5 to children in need. You can fly solo or spread the joy even further by engaging your children, work colleagues, friends and family in a festive sweater party. Not only will you be making a fashion statement, but you’ll be bringing attention to Save the Children’s mission of giving children living in poverty a healthy start, an opportunity to learn and protection from harm. Look into the recesses of your closet; many of us, parents and kids alike, have a holiday-themed sweater we only wear once a year. If you don’t own an iconic holiday sweater, you can buy, borrow, or even glitz up a regular sweater with tinsel or cut-outs of stars and snowflakes. Who knew a sweater could do so much? But why stop at involving your children in our sweater day? There are many other ways children can brighten the environment and the lives of those around them. Parenting blogs are a great resource to search for other inspiring ideas for involving kids in giving back this holiday season. Front Row Mama suggests children write thank-you notes to the custodians at school; put candy canes and a note on the cars in the teacher’s parking lot; leave a package of diapers and wipes on the changing table in a public bathroom; and help prepare a meal for a family in need. Mom Start recommends children find a local “Giving tree” and pick someone to shop for; save up old soda cans, then return them for the bottle deposit; then choose a charity to donate to; go through their closet and clean out any old toys they don’t want any more to donate; and be challenged to do one nice thing for another child every day for 12 days. Amy Bizzarri of Social Moms Network encourages children visit an elderly neighbor, shovel a neighbor’s walk or driveway, help at a local animal shelter and create activity boxes for children in homeless shelters. One additional option is to donate or buy a gift from Save the Children’s gift catalog. Kids can chose from items like sending a girl to school or giving a family a goat. And thanks to our partner, Johnson & Johnson, you can double your impact. The company will generously match each dollar donated through our gift catalog. Perhaps you have a few ideas that you do with your children to share? I would love to hear them in the comments below. I hope you will join us this Friday, Dec. 12 to turn these holiday celebrations into something more meaningful and fun for the entire family. 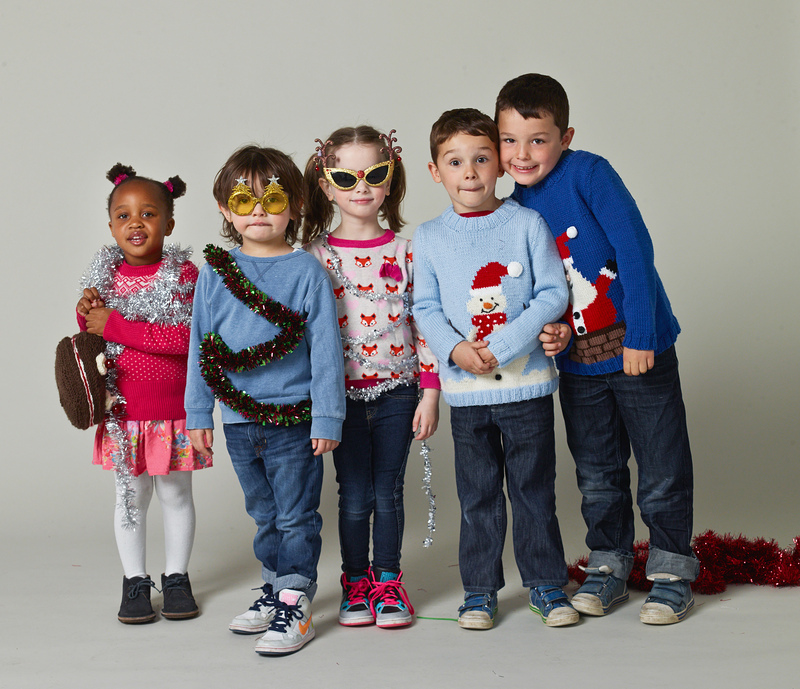 Together, with sweaters, we can transform children’s lives and the future we all share.